This method of trypanosome separation from blood depends on their surface charge being less negative than mammalian blood cells. Infected blood is placed and treated on an anion-exchanger column. This method, the most fitting diagnostic for African trypanosomiasis, provides purified parasites for immunological, biological, biochemical, pharmaceutical and molecular biology investigations. Courtois, P., Nabos, P., Nzoumbou-Boko, R., Reix, C. E., Dauchy, F. A., Daulouede, S., Bringaud, F., Robinson, D. R., Vincendeau, P. Purification of Extracellular Trypanosomes, Including African, from Blood by Anion-Exchangers (Diethylaminoethyl-cellulose Columns). J. Vis. Exp. (146), e58415, doi:10.3791/58415 (2019). This method allows the separation of trypanosomes, parasites responsible for animal and human African trypanosomiasis (HAT), from infected blood. This is the best method for diagnosis of first stage HAT and furthermore this parasite purification method permits serological and research investigations. HAT is caused by Tsetse fly transmitted Trypanosoma brucei gambiense and T. b. rhodesiense. Related trypanosomes are the causative agents of animal trypanosomiasis. Trypanosome detection is essential for HAT diagnosis, treatment and follow-up. The technique described here is the most sensitive parasite detection technique, adapted to field conditions for the diagnosis of T. b. gambiense HAT and can be completed within one hour. Blood is layered onto an anion-exchanger column (DEAE cellulose) previously adjusted to pH 8, and elution buffer is added. Highly negatively charged blood cells are adsorbed onto the column whereas the less negatively charged trypanosomes pass through. Collected trypanosomes are pelleted by centrifugation and observed by microscopy. Moreover, parasites are prepared without cellular damage whilst maintaining their infectivity. Purified trypanosomes are required for immunological testing; they are used in the trypanolysis assay, the gold standard in HAT serology. Stained parasites are utilized in the card agglutination test (CATT) for field serology. Antigens from purified trypanosomes, such as variant surface glycoprotein, exoantigens, are also used in various immunoassays. The procedure described here is designed for African trypanosomes; consequently, chromatography conditions have to be adapted to each trypanosome strain, and more generally, to the blood of each species of host mammal. These fascinating pathogens are easily purified and available to use in biochemical, molecular and cell biology studies including co-culture with host cells to investigate host-parasite relationships at the level of membrane receptors, signaling, and gene expression; drug testing in vitro; investigation of gene deletion, mutation, or overexpression on metabolic processes, cytoskeletal biogenesis and parasite survival. The method presented described here allows the separation of trypanosomes, parasites responsible for animal and human African trypanosomiasis (HAT), from blood. This is the best method for diagnosis of first stage HAT and furthermore this parasite purification method permits robust serological and research investigation. HAT is caused by Tsetse fly transmitted Trypanosoma brucei gambiense and T. b. rhodesiense1. These protozoan parasites multiply extracellularly in the bloodstream, lymph, and interstitial fluids during the first stage of the disease (hemolymphatic stage). The second stage (meningoencephalitic stage) begins when parasites cross the blood brain barrier; neurological signs, including a sleep disorder, which has given its name "sleeping sickness" to this disease, are typical of this second-stage2. Related trypanosomes (T. evansi, T. congolense, T. vivax, T. b. brucei) are the causative agents of animal African trypanosomosis (AAT)3. The World Health Organization (WHO) aims to eliminate HAT as a public health problem by 2020 and to stop transmission by 20304. The recent introduction of rapid diagnosis tests has improved serological diagnosis1,4,5. Several molecular diagnostic tests have been developed but their role in field diagnostics has not yet been established5. They are used to identify the sub-species of the brucei group and atypical trypanosomiasis caused by parasites responsible for animal trypanosomosis6. The detection of the parasite is essential for the diagnosis, treatment and follow-up, as serology can give false positive and unfortunately false negative results1. The direct microscopical observation of these hemoflagellate protists is difficult in HAT cases that are caused by T. b. gambiense, (more than 95% of cases) as low parasitemias are the rule, whereas for HAT caused by T. b. rhodesiense, a large number of parasites are frequently present in the blood. Various concentration techniques have been used, such as thick drop and capillary tube centrifugation (CTC), but the separation of parasites from blood by a column of anion-exchanger (DEAE cellulose) followed by centrifugation and microscopic observation of the pellet, is the most sensitive method (around 50 parasites/mL of blood can be detected)1,7. Consequently, the purification of trypanosomes by this anion-exchangers (DEAE cellulose) method is the best and, to date, the reference method for visualizing and isolating parasites from blood for HAT diagnosis. In field conditions, a mini-column of DEAE cellulose has been successfully used and several improvements have facilitated microscopical observation7,8. The method of trypanosome separation from blood, described below, depends on parasite surface charge, which is less negative than mammalian blood cells9. Interestingly, this method was developed 50 years ago, in 1968 by Dr. Sheila Lanham, and remains the gold standard for detection and preparation of bloodstream trypanosomes. It is fast and reproducible for salivarian trypanosomes from a wide range of mammals, permitting the diagnosis of both animal and human trypanosomiasis10. To obtain living, purified parasites, infected blood is added onto an anion-exchanger column. Chromatography conditions (mainly pH, ionic strength of buffers/media) have to be adapted to each trypanosome species, and more generally, to each mix of mammalian blood cells and trypanosomes10. Elution buffer is precisely adjusted to pH 8 for most African trypanosomes10. This method favors the concentration of parasites found in the blood of patients, because parasitemias can be too low to be detected by microscopic observation alone, and it also enables laboratory investigations. Working with freshly isolated trypanosomes and on blood from infected animals, using this technique, is more pertinent for various investigations than studies with parasites that have been cultured in axenic conditions in the laboratory for an indefinite period. Host-parasite relationships are best studied with a parasite infecting its natural host, therefore, T. musculi, a natural murine parasite, which is representative of extracellular trypanosomes, has many advantages as murine infection involves in a small laboratory animal and does not require biohazard safety level (BSL) conditions. T. musculi does not kill immunocompetent mice, unlike many other Trypanosoma species, including human pathogens. T. musculi are not eliminated in T cell-deprived mice and parasitemias can be increased in infected mice by modifying food and nutrient intake11. This parasite modulates the immune response in co-infections with other pathogens12. T. musculi from infected mice exhibit differences from cultured T. musculi, for example, the expression of membrane Fc receptors is lost in T. musculi axenic cultures, compared to parasites purified from infected mice13,14. Excreted-secreted factors (ESF) are also qualitatively and quantitatively less expressed in axenic trypanosome cultures and differ between strains isolated in endemic areas15. ESF are the first antigens to be displayed to the host immune system and so play an important role in the initial host immune response16. In experimentally infected animals for laboratory investigations, this protocol facilitates experimentation on a greater number of parasites, minimizing the number of mice required especially when using immunosuppressed animals. The variant surface glycoproteins (VSGs) that are used in the Card Agglutination Test for Trypanosomiasis (CATT) in mass screening are still purified from trypanosomes that are propagated in rats. The two rapid diagnostic tests (individually wrapped cassettes) that are now available for use in the field, are still using an infective model source of native VSGs and not in vitro cultured trypanosomes1,4,5. The advancement in the study of trypanosome immunology and biology has been facilitated since these DEAE cellulose purified parasites can be easily obtained in large quantities from naturally or experimentally infected hosts, and in particular, rodents. Investigations conformed to the Guidelines for the Care and Use of Laboratory Animals (NIH Publication No. 85±23, revised 1996). Protocols were approved by our local ethics committee. Keep female Swiss (OF-1) mice aged eight to ten weeks old, 20-25 g, in an animal housing facility fifteen days before each experiment. House them in ventilated boxes that are kept in a protected, temperature (22 °C) and humidity (50%) controlled room, with 12 hours on/off light cycle. Give animals free access to food and water. Minimize pain, suffering and distress and provide enrichment of the environment. For housing, use clear-walled cages, enrichment with wooden sticks and cardboard tunnels. Gently draw an animal into a tunnel to transfer it from the cage to the palm of the hand. Perform daily monitoring to assess signs of prostration, social isolation, body injury, ruffled hair, or lack of grooming. Weigh each animal once per week. Perform regular inspections by a veterinarian. For natural parasites, collect blood at the peak of parasitemia and for parasites causing animal death, collect blood the day before presumed death. NOTE: All experiments with infectious agents are performed in dedicated rooms, according to university approved guidelines. Penicillin (100 U/mL), Streptomycin (100 µg/mL), and Phenol red (5 µg/mL). Plan around 5 hours for the DEAE-cellulose preparation. Wash 100 g of DEAE-cellulose with distilled water in a flask with a narrow neck and allow to settle, then discard fine particles. Repeat washes until the supernatant is clear. Add 3 L of concentrated 2x Phosphate-Buffered Saline and stir. Adjust pH to 8.0 with 1 M KH2PO4 and discard supernatant. Wash twice with distilled water and leave to settle. Wash and allow to settle twice with 3 liters Phosphate-Buffered Saline-Glucose and discard the supernatants. Measure the volume of cellulose and add an equal volume of Phosphate-Buffered Saline-Glucose, distribute into plastic bottles and store at -20 °C. Collect trypanosome strains in areas endemic for human and animal trypanosomiasis. Keep parasites frozen in liquid nitrogen. NOTE: Trypanosoma musculi is non-pathogenic to humans and is an extracellular trypanosome used to safely replace pathogenic trypanosomes in various laboratory experiments. In the case of laboratory investigations requiring human pathogens, handle experiments with care in dedicated appropriate biohazard safety level (BSL) conditions and precautions; BSL2 for T. b. gambiense and BSL3 for T. b. rhodesiense. In field conditions, standard microbiological practice is established: secure sampling, mechanical pipetting, frequent decontamination of surfaces, and sterilization of waste. Rapidly thaw parasites in a water bath at 37 °C. Observe a drop of thawed infected blood with a microscope. Assess parasite viability by measuring the percentage of motile forms17. Inject parasites intraperitoneally into mice (0.5 mL per mouse). Each day, post-infection, collect 20 µL of tail blood by needle puncture and observe under a microscope. Evaluate parasitemia according to Herbert and Lumsden18 by counting parasites in several microscope fields, or by using a haemocytometer. When the parasitemia reaches a threshold that is defined for each strain, collect the blood (1 mL/mouse) in the elution buffer (5 mL/mouse) containing heparin (10 U/mL). NOTE: The original and novel work of Lanham and Godfrey reported the optimal ionic strength of phosphate buffered saline glucose for several host/parasite species from a pH 8.0 stock solution. NOTE: All experiments from this point onwards must be done in a tissue culture hood wearing gloves. The room temperature and humidity in the laboratories used were 22 °C and 45% respectively. In field conditions, parasite separation has been successfully performed at 34 °C. Place a 10 mL syringe in a vertical support and add a previously cut circular, piece of filter paper, glass wool or cellulose sponge. Pour the DEAE cellulose into the syringe until the 8 mL level is reached, and then wash with 25 mL of elution buffer. Carefully add 2 mL of diluted blood at the top of the column and then add elution medium. Regularly add elution buffer according to the transit of the trypanosomes. Collect effluent drops from the columns in a centrifuge tube and check regularly for the presence of parasites with a microscope. When parasites are no longer detected in the column effluent, centrifuge the tube (1,800 x g, 10 minutes, at 4 °C in the laboratory and at ambient temperature in field conditions). Remove the supernatant and suspend the parasites in 1 mL of the relevant medium required for the next investigative step. Count parasites with a hemocytometer and dilute them in appropriate medium if necessary. Purified trypanosomes have been used in pharmaceutical tests. Parasites are transferred into culture wells containing serial dilutions of specific drugs, either alone or mixed19. Microscopic observations, evaluating motility is a marker of viability, can be performed when only a few dugs are being tested, whereas AlamarBlue cell viability assay is an excellent method for large motility assays during drug screening20. 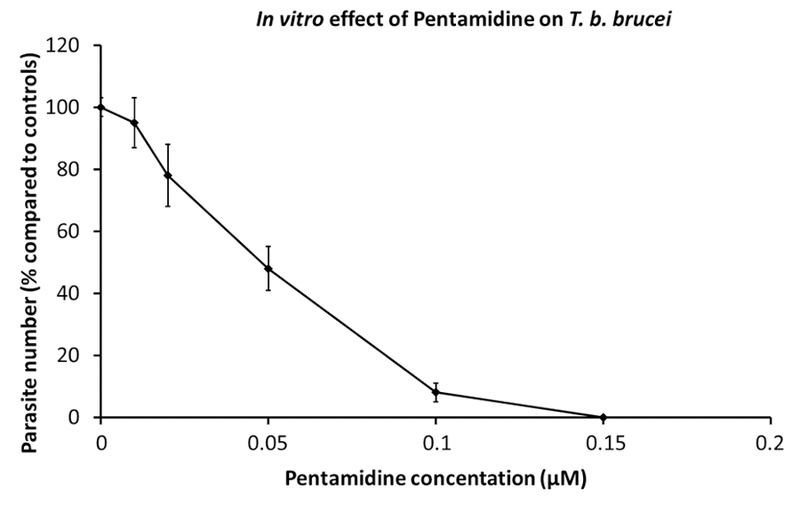 The effect of pentamidine, a reference drug used in HAT therapy, is displayed in Figure 1. Macrophages are very useful in cultures as feeder cells. They allow, in vitro, the initiation and development of trypanosome cultures21. We have reported that the numbers of alternatively activated macrophages are increased in trypanosome-infected mammals in which they favor parasite growth22. This alternative macrophage activation supplies L-ornithine, which is essential for parasite growth. In vitro macrophage-parasite co-cultures have shown that trypanosomes induce macrophage alternative activation via secreted factors. Extracellular trypanosomes secrete a kinesin which binds macrophage mannose binding receptors inducing arginase expression providing L-ornithine production favoring parasite differentiation and multiplication23,24 (Figure 2). Mannose inhibits kinesin binding and arginase induction, and mannose receptor-deficient mice elucidate the target of kinesin on macrophages (Figure 3). Since numerous trypanosome genomes have now been sequenced and annotated, we have been able to take advantage of these large data sets. Subsequently, we have been able to carry out forward and reverse genetics on these parasites. Using these data, purified bloodstream form trypanosomes have been used to characterize and analyze important structures such as the flagellar pocket (FP) and its associated cytoskeleton. The FP is the sole site of endo and exocytosis in trypanosomes and is also where the variable surface glycoproteins are trafficked from the endomembrane system25. The flagellar pocket collar (FPC) is an annular shaped structure that is attached to the flagellum at the point where it exits the FP, but until recently little was known about the protein constituents of the FPC. We have identified a major protein of the FPC, TbBILBO1, and have shown that it is essential for parasite survival both in the cultured insect tsetse fly form and in the bloodstream form26. Knockdown of TbBILBO1 by RNAi prevents FP formation and inhibits the biogenesis of many other important cytoskeletal structures, making the FPC and the FP important targets for intervention in all pathogenic trypanosomes. Probing purified or cultured parasite cells with antibodies to TbBILBO1 indicates that in bloodstream form and procyclic (insect) form, it creates a ring-shaped structure that circumvents the flagellum. Such labeling, on a bloodstream form, is shown in Figure 4. Purified bloodstream form trypanosomes have allowed the characterization of many unusual biochemical and metabolic peculiarities, including metabolism of glucose, which takes place in peroxisome-like organelles called glycosomes (see Figure 5). It was generally accepted that pyruvate is the major end-product excreted from glucose metabolism by the bloodstream trypanosomes, with virtually no production of succinate and acetate inside the mitochondrion. In contrast, the procyclic trypanosomes convert threonine into acetate and glucose into succinate and acetate27,28. Energy metabolism of trypanosomatids can be evaluated by adaptation to available carbon sources. Combining reverse genetics and metabolomic analyses confirmed production in the mitochondrion of bloodstream trypanosomes of acetate from glucose-derived pyruvate and threonine, as well as production of succinate from glucose19,20 (Figure 5). For instance, 1H-NMR analysis of end products excreted by bloodstream form trypanosomes incubated in PBS containing 4 mM glucose, revealed that glucose is mainly converted into pyruvate (85.1% of the excreted end products), with minor production of alanine (9.2%), acetate (4.9%) and succinate (0.8%)29. These pathways, which are minor in terms of metabolic flux compared to pyruvate production from glucose, are essential for growth of the parasite. The succinate production pathway can thus be considered as a good potential target for the development of new trypanocidal drugs. Figure 1: In vitro effect of pentamidine on T. b. brucei. Dilutions of pentamidine were added to 2 x 105 parasites to determine the concentration inhibiting parasite growth by 50% (IC50). Dose-effect curves at 24 hours of culture. Error bars represent the standard error of the mean from 5 independent experiments. Please click here to view a larger version of this figure. Figure 2: Trypanosome-mediated arginase induction. A kinesin released by trypanosomes binds to C-type lectin receptors leading to arginase induction. This results in increased production of L-ornithine and polyamines, essential for parasite growth and differentiation, and in L-arginine depletion, resulting in lower production of cytotoxic NO by macrophage NOS II. Please click here to view a larger version of this figure. Figure 3: Macrophage arginase activity. 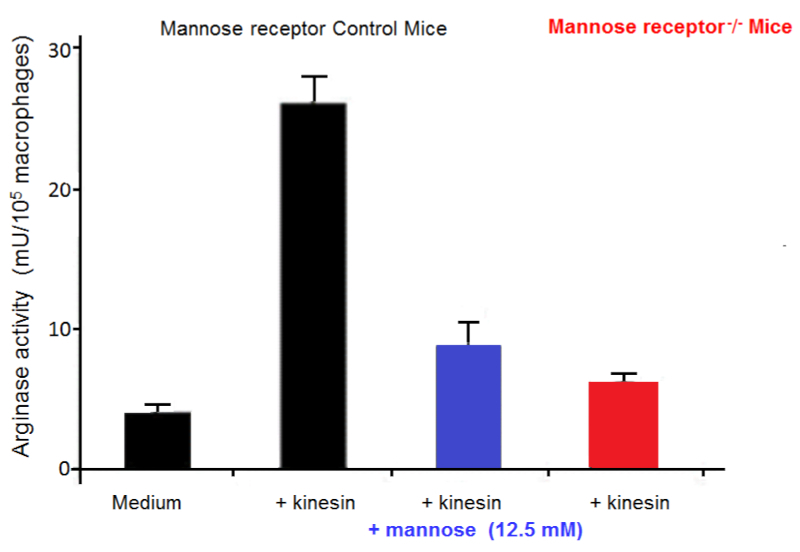 Arginase activity in macrophages from control mice and Mannose receptor knock out (KO) mice cultured in vitro in medium for 48 hours, with or without kinesin or mannose. Error bars represent the standard error of the mean from 5 independent experiments. Please click here to view a larger version of this figure. Figure 4: TbBILBO1labeling of a bloodstream form Trypanosoma brucei brucei cell (A) Immunofluorescence labeling of a bloodstream, culture form, 427 90-13 cell that has been probed with anti-BILBO1 monoclonal antibody followed by a FITC-labelled anti-mouse antibody and visualized using ultraviolet light, (TbBILBO1 are the green annular signals) and the DNA binding dye DAPI (blue signals) (B) A merge of DAPI, anti-BILBO1 and phase contrast images of A. Scale bar equals 10 µm. Anti-BILBO1 mouse monoclonal was diluted 1:10 in PBS and the secondary antibody (anti-mouse IgM FITC) was diluted 1:100. Images were taken on a microscope fitted with a digital camera. Please click here to view a larger version of this figure. Figure 5: Schematic representation of glucose and threonine metabolism in bloodstream form trypanosomes. Excreted end-products from glucose and threonine metabolism are boxed. The thick blue arrows indicate enzymatic steps of glucose metabolism leading to pyruvate production, which is the main end-product excreted from glycolysis. Black arrows represent overlooked minor metabolic pathways from glucose and threonine degradation, which are essential for growth of the parasite. The contribution of the indicated enzymes has been experimentally validated: ACH, acetyl-CoA thioesterase (EC 3.1.2.1); ASCT, acetate:succinate CoA-transferase (EC 2.8.3.18); AKCT, 2-amino-3-ketobutyrate coenzyme A ligase (EC 2.3.1.29); PEPCK, phosphoenolpyruvate carboxykinase (EC 4.1.1.49); PDH, pyruvate dehydrogenase complex (EC 1.2.4.1); TDH , threonine 3-dehydrogenase (EC 1.1.1.103). Abbreviations: AcCoA, acetyl-CoA; AOB, amino oxobutyrate; DHAP, dihydroxyacetone phosphate; G3P, glyceraldehyde 3-phosphate; MAL, malate; OA, oxaloacetate; PEP, phosphoenolpyruvate; PYR, pyruvate. Please click here to view a larger version of this figure. Purified trypanosomes represent a powerful means to study immunology, biochemistry, cellular and molecular biology. Large expanses of data and results have been obtained from trypanosomes, which has then helped to obtain information from other eukaryotic cells30. Trypanosomes are also the subject of important and interesting research because they have devised numerous mechanisms that permit them to survive and grow in two very different environments: the tsetse fly vector and the mammalian host23,31. Various techniques to isolate trypanosomes have been reported, and a review on microfluidics-based approaches has recently been published32. Hence, a reproducible and robust means of parasite isolation is essential. DEAE cellulose preparation is an indispensable step in this parasite preparation protocol. Washing conditions have to be performed cautiously to eliminate the fine particles, and equilibrate the resin, and the pH must be precisely adjusted (pH 8.0 is apt for most trypanosome species). All steps have to be adjusted to improve parasite purification and yield while maintaining parasite viability and cellular properties. Importantly, parasite viability and infectivity have been maintained after purification through a DEAE-cellulose column. However, some strains are more fragile than others and might be less infective after purification33. Therefore, the impact of separation conditions on pellicular membrane components, parasite metabolism, signaling, nucleic acid functions, and animal infectivity, have to be assessed and separation conditions have to be adapted accordingly. Limitations to this technique are that this procedure has to be adapted to each trypanosome species in a given host and is also time consuming. Moreover, DEAE cellulose is now expensive. Preliminary assays are necessary to optimize separation conditions, notably the media, which may have varying ionic strengths and a precise pH. Pre-column steps, including anticoagulant choice, prior centrifugation to remove the majority of erythrocytes, buffy coat use, and erythrocyte lysis, are chosen according to each experiment. Precise changes on a single parameter (buffers, temperature throughout the protocol, centrifugation parameters) might greatly increase the number, degree of purification and viability of parasites obtained33. Developing new separation parameters according to parasite species and the mammalian blood cells to be separated, might be necessary. Adjustments to the initial Lanham and Godfrey's protocol has allowed the purification of biologically and antigenically preserved T. cruzi from blood34. New resins can also be tested and used with appropriate conditions for different species35. The major role of excreted/secreted factors (ES) by trypanosomatids has recently been emphasized16. ES contain molecules involved in pathology and immunomodulation, such as kinesin, which is conserved among trypanosomes24. ES preparation from purified parasites requires particular care to avoid contamination by elution media components and lysed parasites. An ES-based vaccine effective against Leishmania, a related parasite, already exists and is available (CaniLeish Virbac)36. Association of conserved molecules playing essential roles in parasite survival and growth might represent the basis for a future vaccine against trypanosomes, for both humans and animals, in a one-health approach. Purification of African trypanosomes from blood by DEAE-cellulose columns, with improvements, remains the gold standard for trypanosome detection in natural hosts with low parasitemias in endemic areas and for the need for parasites in large numbers for experimental investigations. We thank all members of UMR 177 INTERTRYP IRD CIRAD Université de Bordeaux. This research was supported by internal funding from University of Bordeaux and support from the ANR, LABEX ParaFrap ANR-11-LABX-0024, and from the Association pour le développement de la recherche en parasitologie et médecine tropicale and the Service de coopération et d'action culturelle de l'Ambassade de France à Bangui (Centrafrique). Büscher, P., Cecchi, G., Jamonneau, V., Priotto, G. Human African trypanosomiasis. Lancet. 390, (10110), 2397-2409 (2017). Lejon, V., Bentivoglio, M., Franco, J. R. Human African trypanosomiasis. Handbook of Clinical Neurology. 114, 169-181 (2013). Giordani, F., Morrison, L. J., Rowan, T. G., De Koning, H. P., Barrett, M. P. The animal trypanosomiases and their chemotherapy: a review. Parasitology. 143, (14), 1862-1889 (2016). Aksoy, S., Buscher, P., Lehane, M., Solano, P., Van Den Abbeele, J. Human African trypanosomiasis control: Achievements and challenges. PLoS Neglected Tropical Diseases. 11, (4), e0005454 (2017). Büscher, P., Deborggraeve, S. How can molecular diagnostics contribute to the elimination of human African trypanosomiasis? Expert Review of Molecular Diagnostics. 15, (5), 607-615 (2015). Truc, P., et al. Atypical human infections by animal trypanosomes. PLoS Neglected Tropical Diseases. 7, (9), e2256 (2013). Lumsden, W. H., Kimber, C. D., Evans, D. A., Doig, S. J. Trypanosoma brucei: miniature anion-exchange centrifugation technique for detection of low parasitaemias: adaptation for field use. Transactions of the Royal Society of Tropical Medicine and Hygiene. 73, (3), 312-317 (1979). Büscher, P., et al. Improved Models of Mini Anion Exchange Centrifugation Technique (mAECT) and Modified Single Centrifugation (MSC) for sleeping sickness diagnosis and staging. PLoS Neglected Tropical Diseases. 3, (11), e471 (2009). Lanham, S. M. Separation of trypanosomes from the blood of infected rats and mice by anion-exchangers. Nature. 218, (5148), 1273-1274 (1968). Lanham, S. M., Godfrey, D. G. Isolation of salivarian trypanosomes from man and other mammals using DEAE-cellulose. Experimental Parasitology. 28, (3), 521-534 (1970). Humphrey, P. A., Ashraf, M., Lee, C. M. Growth of trypanosomes in vivo, host body weight gains, and food consumption in zinc-deficient mice. Journal of the National Medical Association. 89, (1), 48-56 (1997). Lowry, J. E., Leonhardt, J. A., Yao, C., Belden, E. L., Andrews, G. P. Infection of C57BL/6 mice by Trypanosoma musculi modulates host immune responses during Brucella abortus cocolonization. Journal of Wildlife Diseases. 50, (1), 11-20 (2014). Vincendeau, P., Daëron, M., Daulouede, S. Identification of antibody classes and Fc receptors responsible for phagocytosis of Trypanosoma musculi by mouse macrophages. Infection and Immunity. 53, (3), 600-605 (1986). Vincendeau, P., Daëron, M. Trypanosoma musculi co-express several receptors binding rodent IgM, IgE, and IgG subclasses. Journal of Immunology. 142, (5), 1702-1709 (1989). Holzmuller, P., et al. Virulence and pathogenicity patterns of Trypanosoma bruceigambiense field isolates in experimentally infected mouse: differences in host immune response modulation by secretome and proteomics. Microbes and Infections. 10, (1), 79-86 (2008). Holzmuller, P., et al. 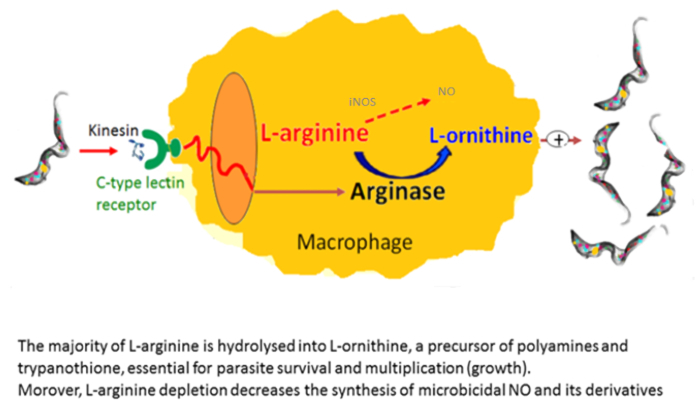 How do parasites and their excreted-secreted factors modulate the inducible metabolism of L-arginine in macrophages? Frontiers in Immunology. 9, 778 (2018). Abrahamson, I. A., Da Silva, W. D. Antibody-dependent cytotoxicity against Trypanosoma cruzi. Parasitology. 75, (3), 317-323 (1977). Herbert, W. J., Lumsden, W. H. Trypanosoma brucei: a rapid "matching" method for estimating the host's parasitemia. Experimental Parasitology. 40, (3), 427-431 (1976). Dauchy, F. A., et al. Trypanosoma brucei CYP51: Essentiality and Targeting Therapy in an Experimental Model. PLoS Neglected Tropical Diseases. 10, (11), e0005125 (2016). Raz, B., Iten, M., Grether-Bühler, Y., Kaminsky, R., Brun, R. The Alamar Blue assay to determine drug sensitivity of African trypanosomes (T. b. rhodesiense and T. b. gambiense) in vitro. Acta Tropica. 68, (2), 139-147 (1997). Albright, J. W., Albright, J. F. In vitro growth of Trypanosoma musculi in cell-free medium conditioned by rodent macrophages and mercaptoethanol. International Journal for Parasitology. 10, (2), 137-142 (1980). Gobert, A. P., et al. L-Arginine availability modulates local nitric oxide production and parasite killing in experimental trypanosomiasis. Infection and Immunity. 68, (8), 4653-4657 (2000). De Muylder, G., et al. A Trypanosoma brucei kinesin heavy chain promotes parasite growth by triggering host arginase activity. PLoS Pathogens. 9, (10), e1003731 (2013). Nzoumbou-Boko, R., et al. Trypanosoma musculi Infection in Mice Critically Relies on Mannose Receptor-Mediated Arginase Induction by a TbKHC1 Kinesin H Chain Homolog. Journal of Immunology. 199, (5), 1762-1771 (2017). Bonhivers, M., Nowacki, S., Landrein, N., Robinson, D. R. Biogenesis of the trypanosome endo-exocytotic organelle is cytoskeleton mediated. PLoS Biology. 6, (5), e105 (2008). Albisetti, A., et al. Interaction between the flagellar pocket collar and the hook complex via a novel microtubule-binding protein in Trypanosoma brucei. PLoS Pathogens. 13, (11), e1006710 (2017). Cross, G. A. M., Klein, R. A., Linstead, D. J. Utilization of amino acids by Trypanosoma brucei in culture: L-threonine as a precursor for acetate. Parasitology. 71, (2), 311-326 (1975). Bringaud, F., Rivière, L., Coustou, V. Energy metabolism of trypanosomatids: adaptation to available carbon sources. Molecular and Biochemical Parasitology. 149, (1), 1-9 (2006). Mazet, M., et al. Revisiting the central metabolism of the bloodstream forms of Trypanosoma brucei: production of acetate in the mitochondrion is essential for the parasite viability. PLoS Neglected Tropical Diseases. 7, (12), e2587 (2013). Coutton, C., et al. Mutations in CFAP43 and CFAP44 cause male infertility and flagellum defects in Trypanosoma and human. Nature Communications. 9, (1), 686 (2018). Cnops, J., Magez, S., De Trez, C. Escape mechanisms of African trypanosomes: Why trypanosomosis is keeping us awake. Parasitology. 142, (3), 417-427 (2015). Barrett, M. P., et al. Microfluidics-Based Approaches to the Isolation of African Trypanosomes. Pathogens. 6, (4), (2017). Taylor, A. E., Lanham, S. M., Williams, J. E. Influence of methods of preparation on the infectivity, agglutination, activity, and ultrastructure of bloodstream trypanosomes. Experimental Parasitology. 35, (2), 196-208 (1974). Gutteridge, W. E., Cover, B., Gaborak, M. Isolation of blood and intracellular forms of Trypanosoma cruzi from rats and other rodents and preliminary studies of their metabolism. Parasitology. 76, (2), 159-176 (1978). Cruz-Saavedra, L., et al. Purification of Trypanosoma cruzi metacyclic trypomastigotes by ion exchange chromatography in sepharose-DEAE, a novel methodology for host-pathogen interaction studies. Journal of Microbiological Methods. 142, 27-32 (2017). Lemesre, J. L., et al. Long-lasting protection against canine visceral leishmaniasis using the LiESAp-MDP vaccine in endemic areas of France: double-blind randomised efficacy field trial. Vaccine. 25, (21), 4223-4234 (2007).